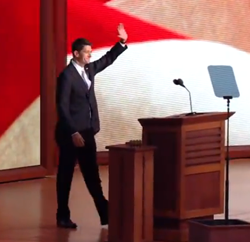 Vice Presidential nominee Paul Ryan was clearly the big draw at tonight's convention. Congressman Ryan hit hard for the future of this country by clearly laying out how he and Mitt Romney would tackle the tough issues that are bankrupting our country. In doing so, Paul Ryan utilized both his young family and his mother to hit home that his reforms would bring "opportunity for the young and security for the old." This is why Democrats have such a difficult time attacking Ryan on facts, even they know that true reforms cannot be beat on merits, so they must resort to fear mongering and personal attacks. Fortunately for my generation, we have a Vice Presidential nominee who will fight to secure a better tomorrow; Wednesday night, this passion to improve our country was on full display!